Smell great under pressure with Roadster Sport. 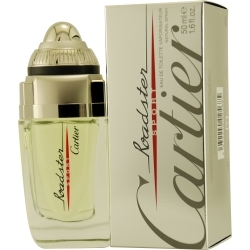 This men's cologne is a powerful scent created by the popular brand Cartier. Introduced in 2009, the fragrance is perfect for daytime use. Strong notes of gaiac wood, sage, and orange blossom are expertly combined with notes of black pepper and mandarin. The resulting cologne is one that projects a masculine scent that is sure to leave an impression. Apply liberally in the morning and be ready to tackle your day. This is a GREAT cologne for man! It is intense to the right point without becoming overpowering. Perfect for daily wear at office, club or just for a walk in town. HIGHLY recommended. Great Job Cartier! !